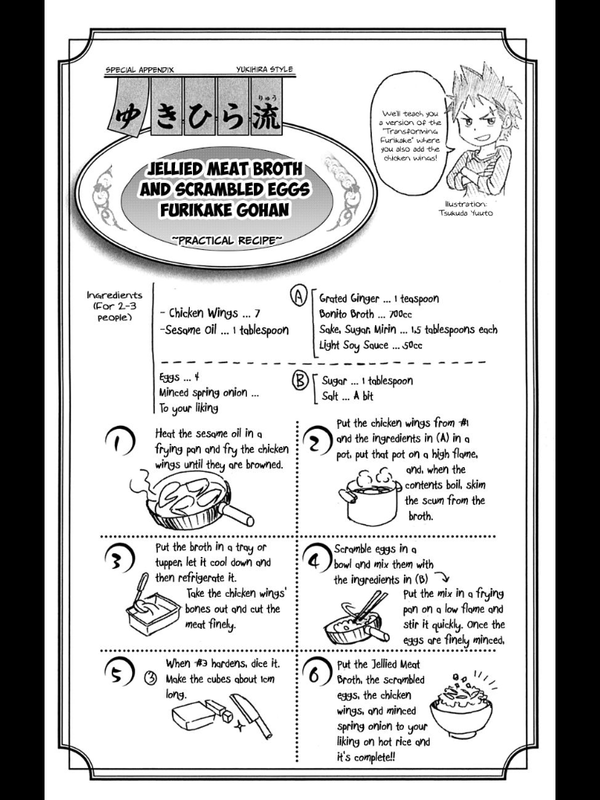 Where can I find a list of recipes (and their directions) that were used in Shokugeki no Soma? I'm reading Shokugeki no Soma and at some points, I thought it would be nice to cook some of these dishes. Unfortunately, I haven't found more than the mackerel burger recipe. I know that not all recipes are published, but I would like to know if there were also other ones that were published. As Krazer said, the recipes can be found on the Japanese tankobon versions as extras. The English version, however, also have the same recipes. At the time of this writing, 6 volumes have been released in English and this Imgur album contains the English version of the recipes up to the 6th volume. It doesn't contain all of the recipes, as you guessed yourself, but it contains most of the meals that the main cast cooked. You can also find partial recipes in the Shokugeki no Soma wiki by looking up the names of the food. They usually only contain the ingredients and not step-by-step instructions on how to prepare the food. 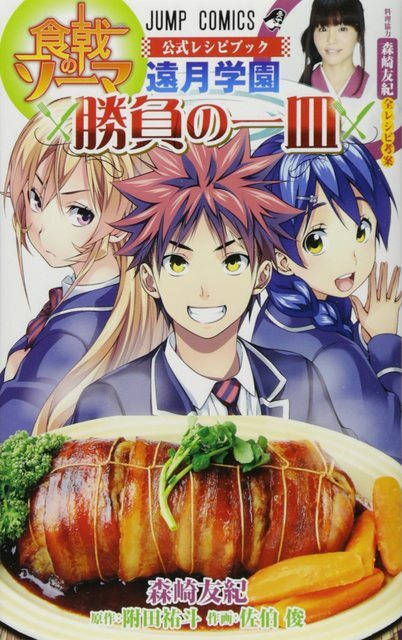 In addition to the extras in the tankobon mentioned in Frosteeze's answer, there's also an official recipe book titled Tōtsuki Academy Challenge Plate: Shokugeki no Soma Official Recipe Book which is currently only available in Japanese. the manga as well as new ones that were either featured in JUMP magazine or inspired by Shokugeki characters' cooking style. Other than that, there doesn't seem any other official recipes published anywhere else. I also want to cook the recipes, as I have cooking as one of my hobbies that I would like to get decent at. What I do is I go to the wikia and find the EXACT list of all ingredients for most recipes, and then for specific directions I try to adapt with both my knowledge and the food descriptions. Example: I cooked the Hachis Parmentier they did on the train trip to the final exam (season 3) team Doujima version. 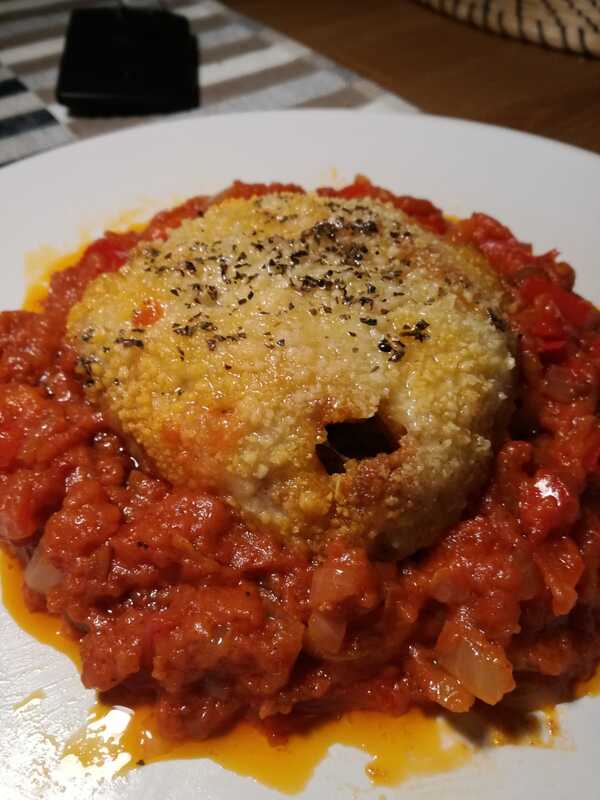 I needed mashed potatoes, sauce espagnole, the meat sauce and the anchoiade sauce. So I either know how to make some of those things, or I dont and I google, so for example: "how to cook fast mashed potatoes", "how to make sauce espagnole", and in multiple scattered websites I go from ingredients to preparation of everything and then i use my cooking skills to get a finished product. This is my Hachis Parmentier. Without the green sauce, used only basil and white vineager. Not the answer you're looking for? Browse other questions tagged shokugeki-no-soma or ask your own question. Are there resources for original recipes in Shokugeki no Soma? What did Tsunozaki Taki say?